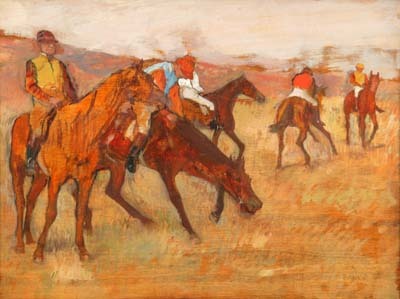 In the later half of his career, Degas sought to capture the restless beauty of thoroughbred racehorses. This wisp of a painting is so thinly laid down that the color and grain of the wood on which it is painted are part of the image. It is an unexpected composition, with daubs of color on the distant silks, and shapes captured as though at shutter speed; this is a wonderful, modern picture. Paintings and sculptures from one of the very best American collections of European art were on loan from The Walters Art Museum in Baltimore. William and Henry Walters, father and son railroad tycoons, amassed their collection over several decades and gave it to the city of Baltimore in 1931 "for the benefit of the public." The exhibition includes work by Raphael, Panini, Ingres, Delacroix, Corot, Pissaro, Degas, Manet, and Monet. "This show delivers a 350-year overview of painting in Europe, from Raphael's 1513 'Madonna with Candelabra' to Edouard Manet's famed "At the Cafe" from 1879. It's a quick ride from the Renaissance through Impressionism. This short period saw some of the world's greatest artwork produced during unprecedented political and philosophical turmoil in Europe. It was tough evolutionary times for the civilized status quo, and very high times for art." "Fabulously wealthy railroad baron William Walters began collecting in the mid-19th century and his fabulously wealthy son continued and escalated the acquisitive rampage throughout his own life. Father and son shared an unusual gift -- both had great eyes. They could recognize (and afford) the pick of the litter. Their appetites were ravenous, their tastes diverse, and they only bought the best. And now, Mint Chief Curator Charles L. Mo has wrangled 60 of the best for us. Lucky us."